I came to live in Birkenhead in the 1950's in a new house at Birkenhead Point. As I remember the first shop was on the right coming up from the wharf and here Ron Clark had a Grocery shop right next door to my parents-in-law. Ron kept bread and everyday items although it was a very small shop. Further along on the opposite corner was Steel's Garage and then the Birkenhead Gospel Hall which seemed to be well attended on Sundays. On the left side firstly there was Crosby-Kent who packed cosmetics and 4711 Eau de Cologne next to Birkenhead Post Office later called Birkenhead South. Continuing up the road was Kingsbeer the carrier (formerly Chas Verran & Sons). Chappell & Cox the undertakers and Mr. Turvey the hairdresser were next followed by Cyril Crocombe's lime juice and Onion factory. He also packed cornflour. Across Rugby Road on the corner was Horace Boles who had a large Grocery shop. Mr. Boles had an assistant named Frank Stuart who delivered grocery orders in a basket attached to the front of a bicycle and the shop was well stocked. If Mr. Boles did not have in stock an item you required he would obtain it for you and have Frank deliver same. 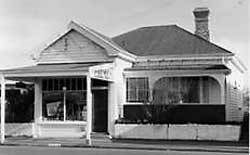 The Service Station and Garage was next and then the Dairy now known as Kai Vita. A few doors along was the Birkenhead Police Station where the Community House now operates. Cedric (son of Edgar) Wallis and his wife Tess owned the large Drapery business which is now Gumdiggers' Restaurant. In addition to fabric by the yard, haberdashery etc. they stocked china, stationery and toys and initially when I came to Birkenhead they ran a small lending library. In an older building Bob White the Chemist had a small shop with living quarters behind. Mr. Merv Rosser ran a Greengrocery shop with Stott's Butchers next door. This was a real old time butchery with sawdust on the floor and tiled walls An enormous wooden chopping block stood in the middle of the area behind the counter and carcases hung from hooks in the ceiling. Sausages were made in the rear area, not bought in as is done today. They sold beautiful meat but were expensive. A Bootmaker (name unknown to me) had a small shop next door to Stott's and carried out boot and shoe repairs and did leather cleaners and dressings. Some yards further on was a ladies hairdresser owned by a Miss Dent. 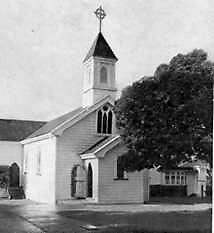 Then there was a huge gap until you reached the two Churches All Saints' Anglican and St. Andrews Presbyterian before you came to a small 4-Square grocery shop with Neary's Gift shop and Ted Neary's Garage in the same building next door to the Council building. 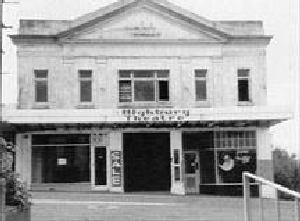 Opposite was the Picture Theatre building with Mrs Langridge's dress shop and the sweet shop each side of the entrance to the cinema. In the old building next door was a Fancy Goods and Gordon & Gotch agency and Mrs Clayworth's Manchester and Soft furnishings. On the same side of the road Oborn's shoes, Ralph Scott menswear and a Mens' Hairdresser.